I've mentioned before that I want this blog to be as much about mental health as it is about physical health. I think a good way to jump-start that aspect of this endeavor is to share with you one of my favorite poems. I keep it hanging on my wall at work, and whenever I get stressed, downtrodden, or generally unhappy, I re-read it and find peace. It is a 1927 American prose poem that became widely known after a Baltimore rector used it in a series of devotional materials in the 1960s. It has since snowballed in popularity, and thanks to that rector (Baltimore has given me some truly wonderful gifts, huh? ), it is available for us to reflect on today (source). Ahhh, I feel better already. Do you? I definitely recommend printing this out and putting it somewhere where you can refer to it whenever times get tough, or just when you need a burst of inspiration. Keep an eye out for inspirational quotes that speak to you. 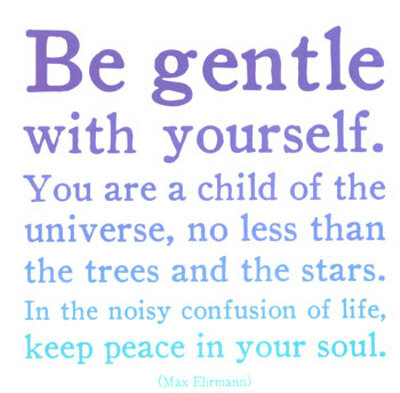 It is a wonder how much a good mantra can improve your morale and center you, and Desiderata is a great starting point for finding one that works for you. Thanks for sharing, Biz. That is still true and beautiful no matter how many times you read it.